This is a sponsored post on behalf of Mom It Forward Influencer Network and Amazon.com. All opinions are my own. 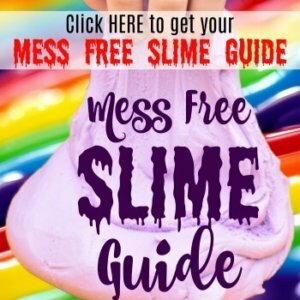 This post contains affiliate links which gives me a small commission when you make a purchase through one of those links. I do most of my shopping via Amazon.com. It’s just so convenient having an Amazon Prime membership with Free Two-Day Shipping and just about everything I can think of at my fingertips. I probably order something at least 1-2 times a week. 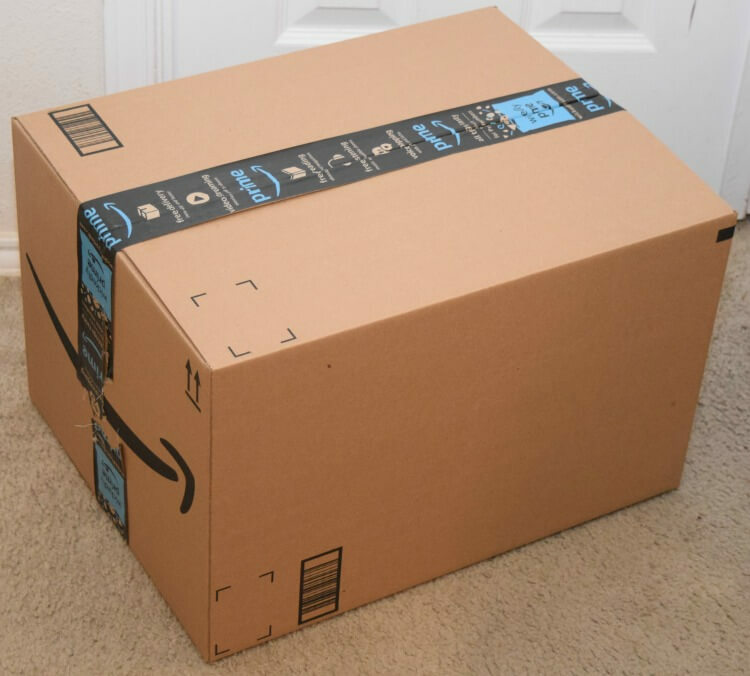 We have a lot of Amazon boxes. Making a costume out of one of them was just the next step! 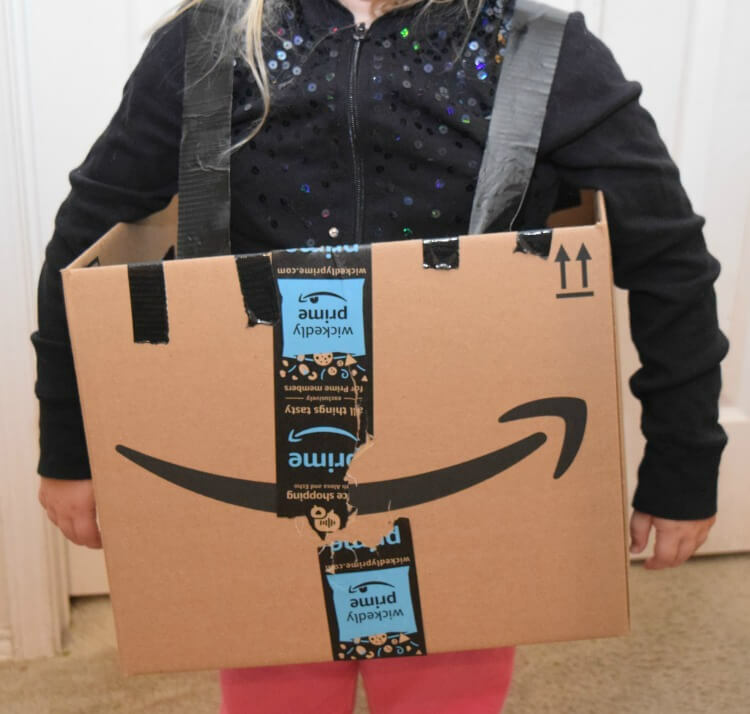 Since most everything we buy comes in a box from Amazon, I thought a “Boxtume” Costume would be a cute idea! 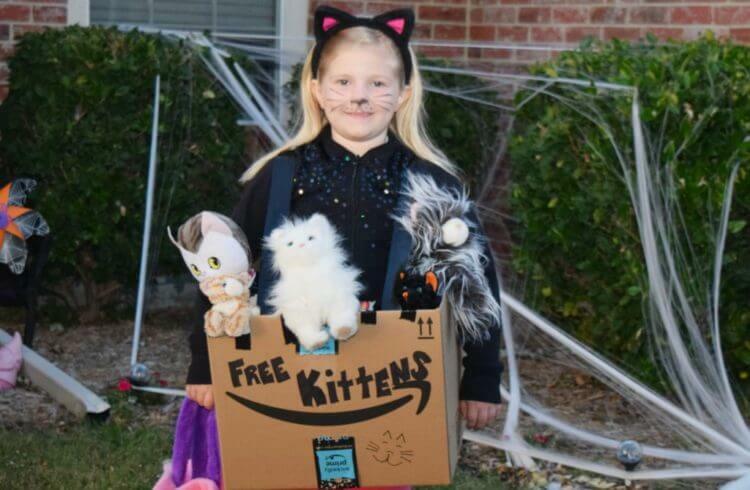 This DIY costume is a Free Kittens Boxtume with your little one as a kitten, too. It’s so easy to make! 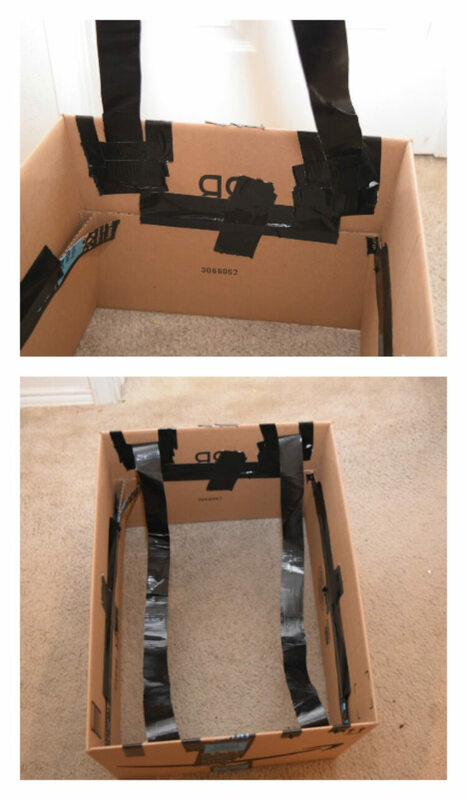 First, prepare the box by folding the top and bottom flaps inwards and duct taping the flaps inside the box. Next, create the straps. 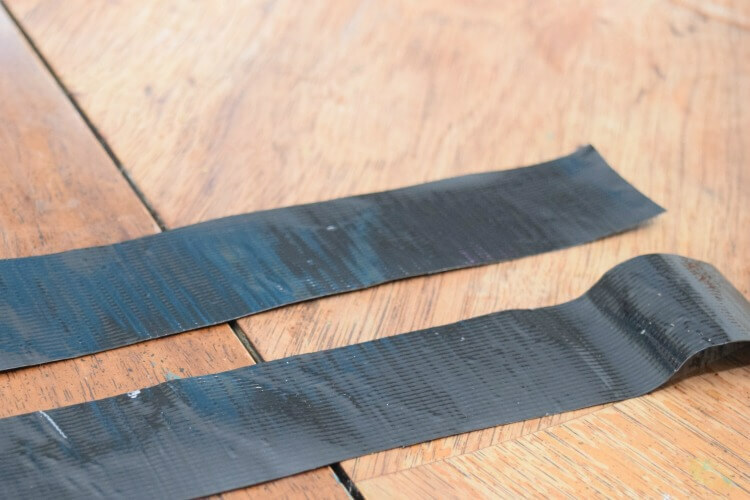 For my 7-year-old I started with 4 pieces of duct tape about 1 yard long each. I stuck two together and then trimmed them down to about 2 inches wide. Then, do this a second time to make the second strap. Next, I duct taped the straps to the inside of the back and front of the box. We tried it on and then, I adjusted as needed. Next is adding the kitties! 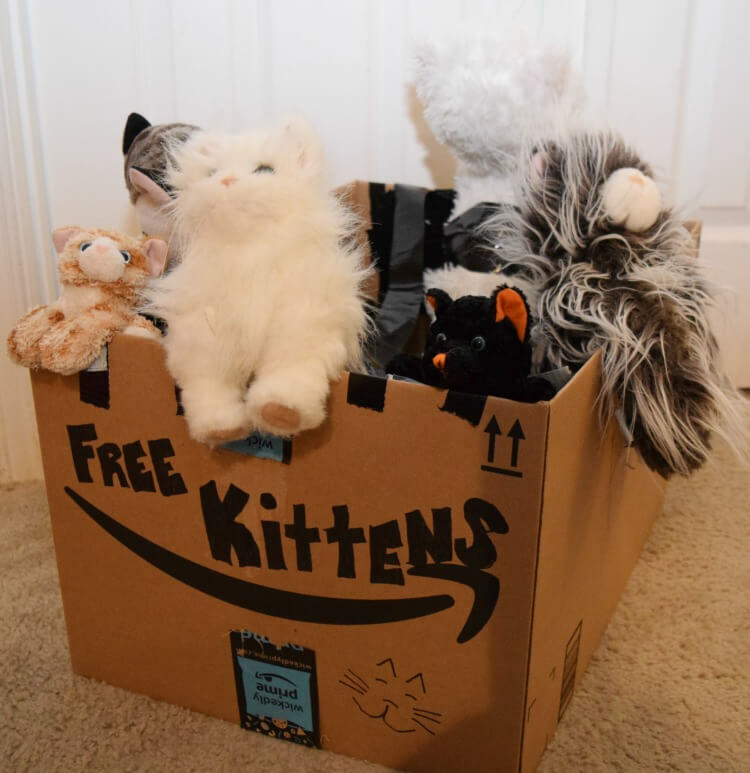 You can find all kinds of stuffed kitties on Amazon. I taped them to the inside of the box so they were partially hanging out. 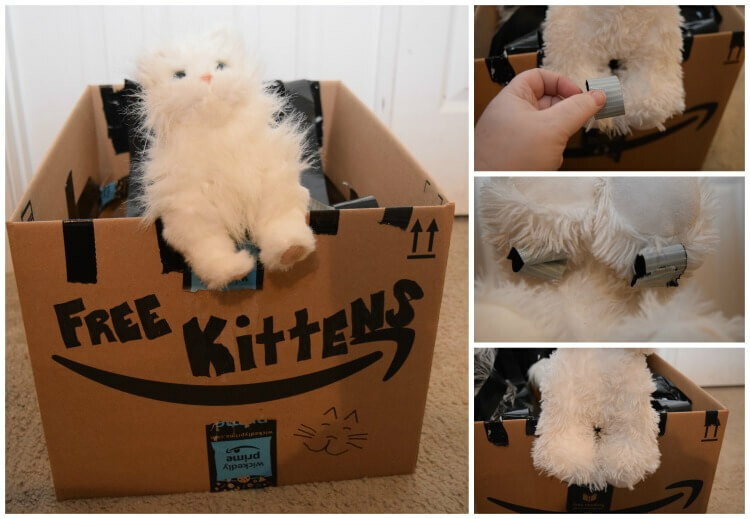 Then, I made little rolls of tape to stick to the back of their legs to stick their front legs on the outside of the box. 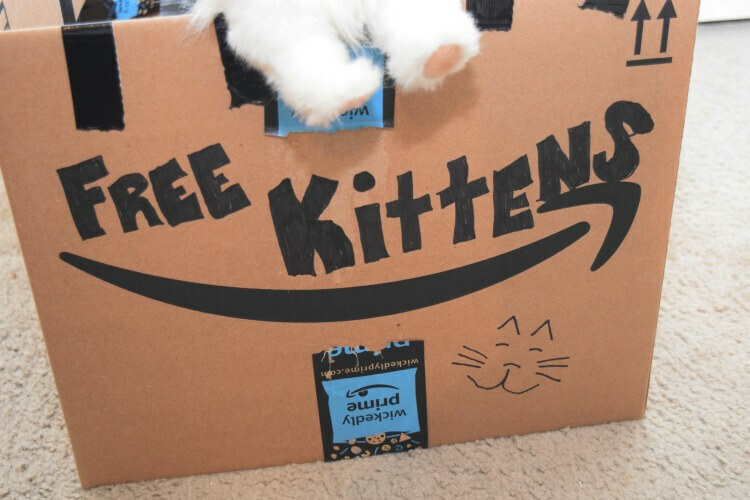 I added the “FREE KITTENS” message to the front of the box and wrote “FREE” on each side of the box as well. 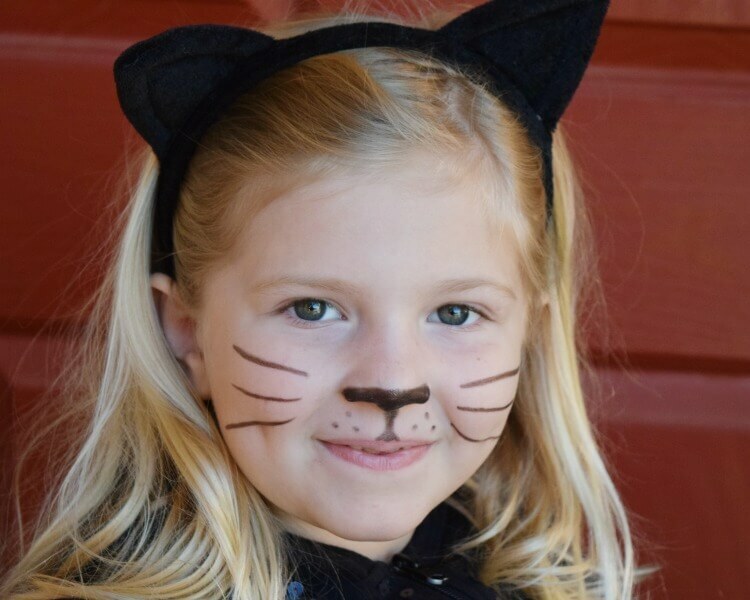 I used a black eyeliner pencil to create whiskers and a nose for my daughter to be a kitten, too. Then, she put on a black jacket, and a pair of cat ears. Now you’re ready to go trick or treating! Once you have all the supplies, this “boxtume” will take less than an hour to put together. It’s fun and easy, and just so cute! Have you decided what you and the kids are going to be for Halloween? You can get all your costume needs on Amazon! This is so creative and fun! Looks easy to put together too! 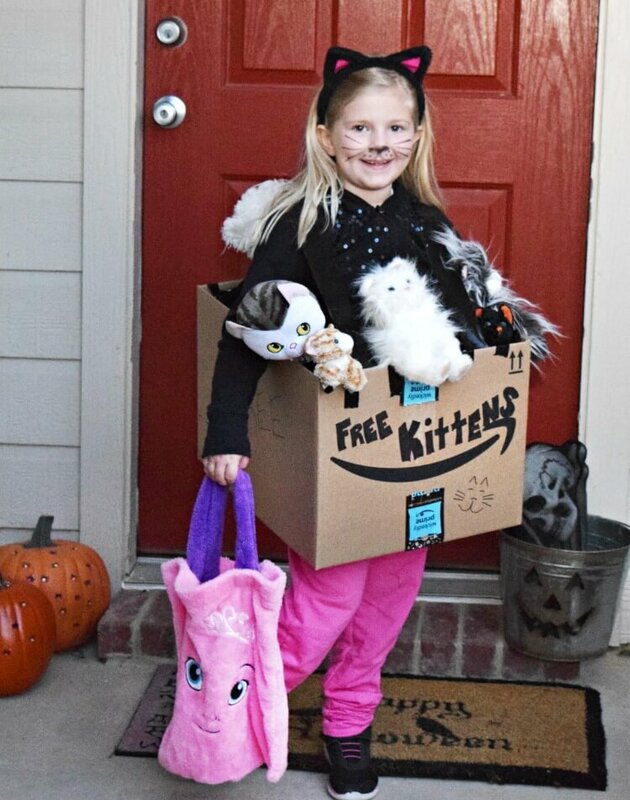 It’s like a younger crazy cat lady costume, LOL! Ha! 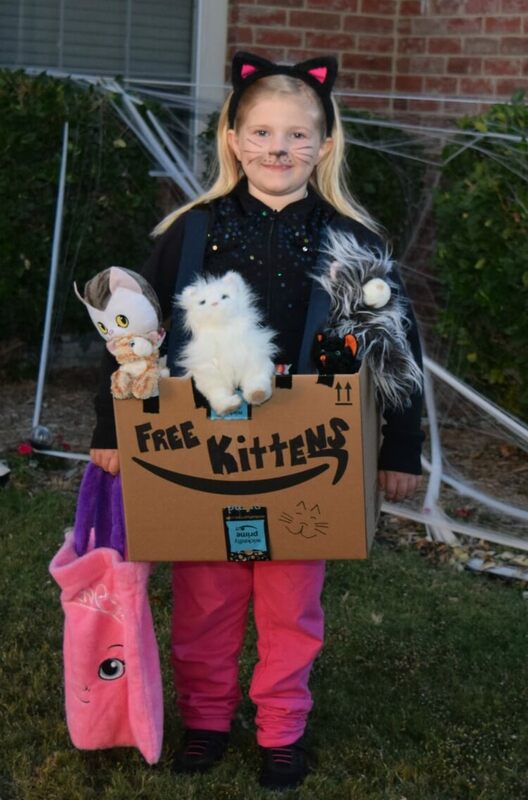 What a cute and unique costume! Most likely won’t be seeing many of these ones out and about! I cannot believe Halloween is in a week! It certainly does NOT feel that way. I have no idea what to dress up as!! This is such a creative costume for a child. Your daughter looks adorable in it and she will be a hit on Halloween. Ha Ha, this is such a unique idea! I think my son would have loved to dress up as this when he was younger! What a great use of items that you had. My boys love making their costumes too. This is such a great costume idea. I will have to share this with my friend for her little one this Halloween. I think only homemade Halloween costumes should be allowed in the world. There. I said it. This is super cute. 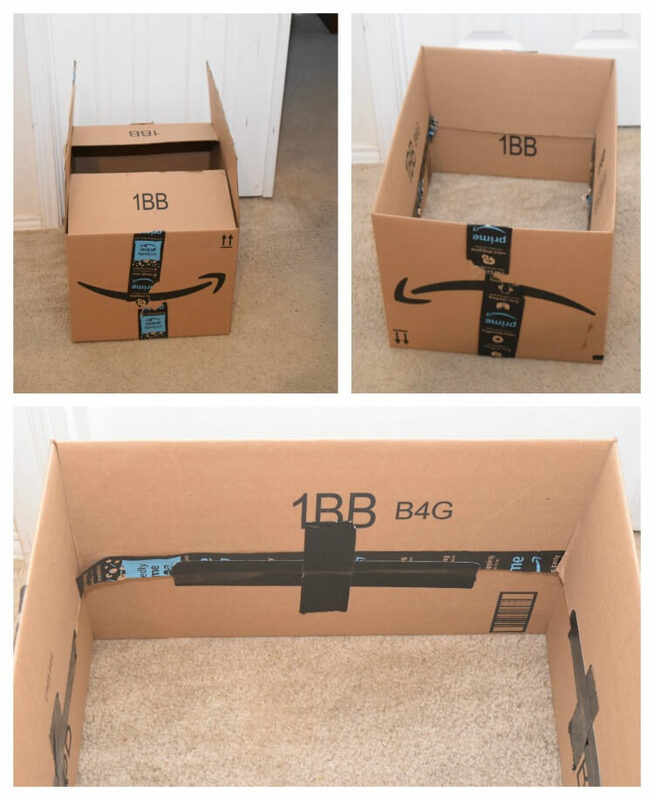 Oh my gosh, what an awesome use of an Amazon box. This is such a cute costume idea. This is definitely a creative idea! I wish I were this creative to make my own for the kids! So creative! We never bought costumes growing up. We always made them ourselves. This is so creative! I think it is great to make homemade costumes with your kids. So much fun. Omg how adorable is she! 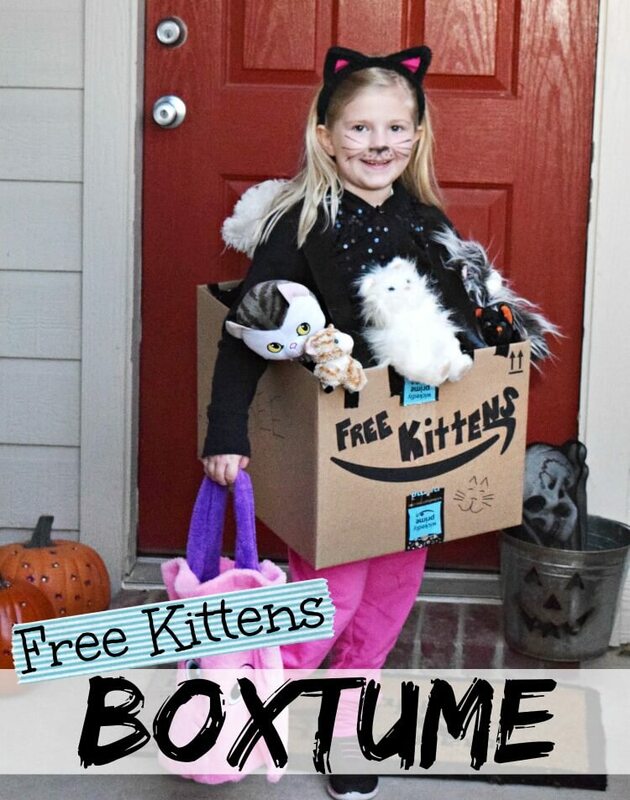 I love this DIY costume with the free kitten boxtume. I could totally see myself doing one for myself lol. How adorbs is this and clever. I love DIY costumes, I think they are the best. This is such a cute idea for a costume! I love to see what DIY costumes people come up with. Super duper cute! Love Halloween costumes like this that involve scouring your home for the supplies. Visiting from Pretty Pintastic Party.